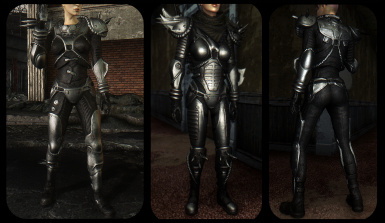 A higher resolution, polished metallic re-texture for both sets of Metal Armor. 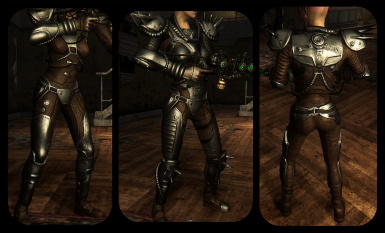 A higher resolution, polished metallic re-texture for both sets of Metal Armor. 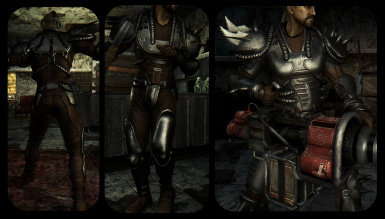 This initially started as a project to make a "classic style" set of metal armors, however I have broadened this into a general high resolution re-texture suite for the Metal Armors. The original appearance was too rough and dim for my liking, not taking advantage of specular maps to create a believably metallic appearance for the armor plating. **Helmet now included. Male version only, male mesh replaces the female one. 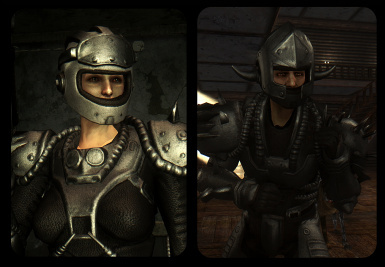 The female helmet was pointlessly ugly and I couldn't do anything for it, so now there's a single unified model for both sexes. Horned motorcycle helmet, how can you go wrong? 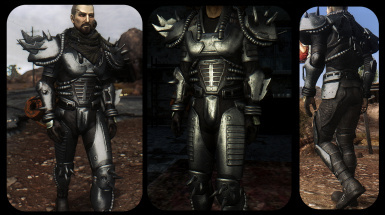 New Vegas Standard Black - A black leather version of the armor, high resolution and polished, but conforming to the Fallout 3/NV color scheme. "Classic Fallout" Khaki Leather - A brown/khaki leather version, more reminiscent of the Metal Armor seen in Fallout 1 and 2, for that old-timey feel. Merely Extract the Data folder of your chosen color set into the New Vegas directory, overwrite if/when necessary. Archive Invalidation Invalidated would be a good idea, or do archive invalidation manually. These textures may or may not be compatible with Body replacer armor meshes, it depends if the UV layout has been altered, likewise these textures were designed to be used with a "Gloss" value of 10, as apposed to the default "60," so depending on the gloss value you may need to alter the gloss value via NifSkope if you use a custom mesh.